Hey people! I bring happy news today: the newest Swooshable project is done! Ever wondered how to find LEGO stores close to you? Or how about the next awesome events? 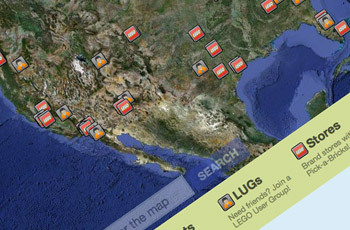 Or maybe the ultimate LEGO User Group? Hah! Easy peasy, with the new Swooshable World! Adam (that fine Repoort-gentleman who moderate this group) and I have been busy putting all of these things ON A MAP! A stroke of genius? Perhaps. All we know is that it makes it pretty darn easy to find things close to you. We really hope to make this a good, lasting resource. Right now we’ve got close to 200 locations indexed, but we know there are more. Help us by adding them to the site or by pointing out errors in the comments! Either here or directly on the site is fine. As always, if you like this project it’s not a bad idea to sign up to the Swooshable mailing list to quickly find out when new apps are out. Let us know how you like this one and how we can make it better! Previous story Why Does LEGO Ignore Girls?